Add to My Favorite Store. 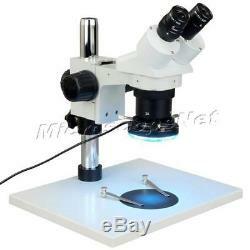 10X-20X-30X-60X Binocular Stereo Microscope + 60 LED Ring Light. High quality optical glass elements. 10X and 20X widefield eyepieces. Sturdy table stand with large base and 2 stage clips. 60 LED ring light provides shadowless illumination. Total magnification: 10X, 20X, 30X, 60X. Microscope body - Binocular, 360° rotatable viewing head - 45° inclined ocular tubes - Diopter adjustment ring on left ocular tube - Interpupillary distance adjustable: 55 - 75 mm (2-3/16" 2-15/16") - Inner diameter of ocular tube: 30.5mm (1-13/64) - Mounting size for auxiliary lens: 48mm female thread. Eyepiece - A pair of widefield WF10X/20 - A pair of widefield WF20X/10. Objective - 1X and 3X. Working distance - 73 mm (2-7/8). Field of view - Max. Illumination - 60 LED ring light - Intensity adjustable - Power adapter: AC 90V - 260V, 50/60Hz - 48mm ring light adapter included. Table stand - Focus adjustment: rack and pinion, range 48mm (1-7/8"), tool-free tension adjustment - Body holder: 76mm (3")in diameter, microscope body 360° rotatable - Post: metal, diameter 32mm (1-1/4"), height 290mm (11-1/2") - Base: metal, 320mm x 260mm x 20mm (12-5/8" x 10-1/4" x 3/4"), with 2 stage clips and a 100mm (4") black/white plastic stage plate. Net weight - 5.1 kg (11 lb 3 oz). A pair of WF10X/20 eyepieces. A Pair of WF20X eyepieces. A pair of rubber eyeshields. A full set of table stand. AC power adapter of ring light. 48 mm thread ring light adapter. Fluorescent ring lights for illumination. LED ring lights for illumination. Gooseneck fiber cold lights for flexible lighting angles. Fiber ring lights with low heat and adjustable intensity. 0.3X auxiliary lens for increasing working distance and field of view. 0.5X auxiliary lens for increasing working distance and field of view. 2.0X auxiliary lens for having higher power levels. USB cameras for computer or monitor. A: We are happy to leave feedback for our customers once we have been paid and the item has been delivered to the carrier. We would appreciate that once you receive your item, you also leave us feedback. If you feel that you cannot leave a Positive comment with all 5 stars - WE WILL EARN IT. We are here to exceed your expectations! The item "OMAX 10X-20X-30X-60X Binocular Stereo Microscope+60 LED Ring Light" is in sale since Thursday, October 02, 2014. This item is in the category "Business & Industrial\Manufacturing & Metalworking\Semiconductor & PCB Equipment\Inspection Equipment". The seller is "bh542" and is located in Northeast. This item can be shipped to United States, Canada, United Kingdom, China, Mexico, Germany, Japan, France, Australia, Denmark, Romania, Slovakia, Bulgaria, Czech republic, Finland, Hungary, Latvia, Lithuania, Malta, Estonia, Greece, Portugal, Cyprus, Slovenia, Sweden, South Korea, Indonesia, Taiwan, South africa, Thailand, Belgium, Hong Kong, Ireland, Netherlands, Poland, Spain, Italy, Austria, Israel, New Zealand, Singapore, Switzerland, Norway, Saudi arabia, Ukraine, United arab emirates, Qatar, Kuwait, Bahrain, Croatia, Malaysia, Chile, Colombia, Costa rica, Panama, Trinidad and tobago, Guatemala, Honduras, Jamaica, Philippines.